Ok, so it's not magic - it's better - it's evidence based! With a team of some of the who's who in nutritional epidemiology Dr. Rebecca Mozaffarian and colleagues explored the various whole grain identifiers currently festooned on fronts-of-packages. 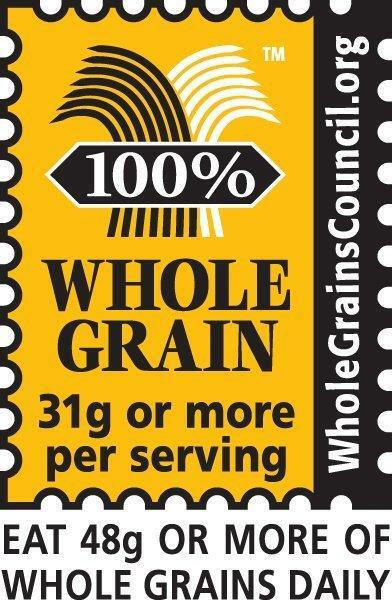 They looked at that food industry sponsored Whole Grain stamp (up above), whole grain as the first ingredient, whole grains first without added sugars, the word "whole" before any grain in the ingredients as well as the ratio of total carbohydrate to fibre. With each they further investigated their relationship with other health-related criteria including fibre, sugar, sodium, calories, trans-fat and price. 545 products later and guess what? Products proudly displaying that food industry sponsored whole grain stamp were found to be significantly higher in both sugar and calories. 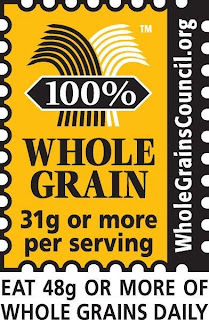 So too were products identified on the basis of a simple hunt for "whole grain" as a first ingredient and the word "whole" before each grain. The ratio of total carbohydrates to fibre where a ratio of 10:1 or lower was the best measure and identified products that broadly contained more fibre, less sugars, less sodium and less trans-fat, along with fewer calories. So if you're trying to figure out which bread, cracker or cereal to buy, to help with your decision, simply divide any product's total carbohydrates by its fibre and look for a number less than 10. Now this isn't a perfect formula as many products nowadays are now being spiked with ingredients such as oat hulls to artificially increase fibre content, but in a pinch, it's certainly an easy rule to remember. Of course the real lesson to be learned here is one that is not particularly surprising - it's that the food industry sponsored whole grain stamp seen up above should be ignored, as should pretty much all industry sponsored front-of-package claims and programs.